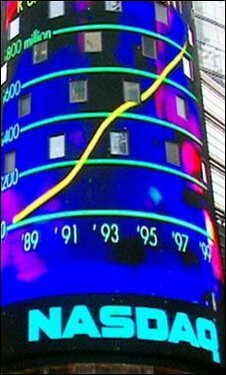 On 10 March 2000, the Nasdaq index of leading technology shares spiked, bursting the Dotcom bubble. The decade that has passed since has brought a new realism to the internet economy. The Nasdaq has failed to recover and currently trades at less than half its peak value on 10 March 2000 as investors are once again looking for real returns and for fundamental underlying value. But technology is playing a much greater role in most people's lives than it did when the bubble burst, so clearly many tech firms are thriving. Some have even grown sufficiently to join blue-chip indexes instead, so the Nasdaq is perhaps no longer the best barometer of the health of what was once deemed the "new economy". These days, nobody uses the term. Indeed, even on 10 March 2000 one analyst said: "A lot of people are tired of hearing about the new economy versus the old economy". At the time, the Nasdaq had risen 24% since the end of 1999 while the Dow Jones index of leading industrial shares had fallen 13%. And the analyst, who was with Prudential Securities, was convinced the Nasdaq would smash through the 6,000-level within 12 to 18 months. "If you're an astute observer, your portfolio will reflect what's new and exciting and dynamic," he said at the time, insisting that "a lot of those are the companies that are in the Nasdaq". Another analyst, from the since collapsed Lehman Brothers, was equally eager to justify the Nasdaq's strength. "It may ease off here and there, we may find the Nasdaq being a little overvalued at some point, but in general it's the way of the future," he said on 10 March 2000. And how we all laugh as we look back at a time when the talk was more important than the walk, and when scruffy entrepreneurs were courted by greedy venture capitalists (VCs), their ties hidden in their pockets. "I remember walking into a First Tuesday event at Lord's Cricket Ground, and there were thousands of people there creating a very special energy," recalls Mark Simon, founder of The Chemistry Club, which at the time brought together VCs with budding entrepreneurs. "At the time, I thought 'there's got to be a way of making money here', but of course I was wrong'." But it is easy to be wise after the event. And it is equally easy to forget that in fact there were plenty of good ideas around at the time. "A lot of the business plans were deeply flawed," acknowledges Mr Simon. "But a lot of the ideas that were around at the time would have worked had there been broadband." What ever happened to the dotcom millionaires?